February 20 was "National Love Your Pet Day," and Land Rover's venerable PR machine swooped in to get some airtime out of it. Normally we make fun of that kind of thing but I think we'll give them a pass, because puppies. Land Rover put a Facebook album together featuring owner-submitted pictures of dogs in Rovers and yeah, they're pretty great. 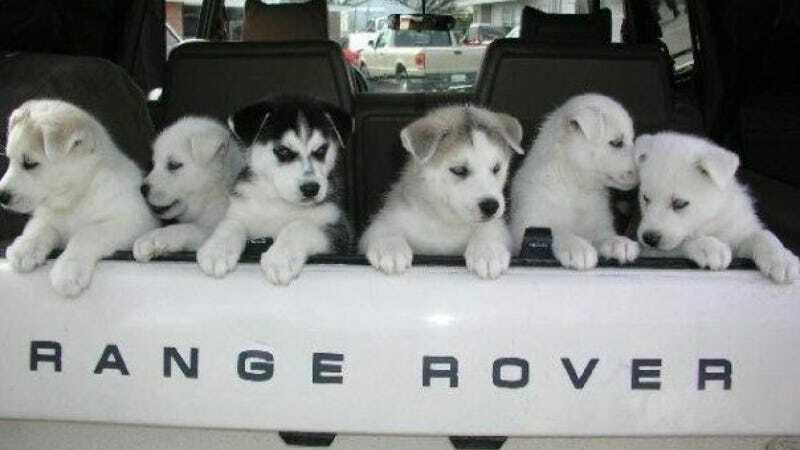 The twelve we liked best include the six pups on top clinging to the rear window of a Range Rover Classic. Lexi looking like a hilarious hairy lollypop in a Range Rover, and Flurrie at the wheel of an old P38. Finn and Woody. Large size variance in animals always makes for a good photo op. If the Range Rover Sport isn't small enough for you, try the VSWB (very short wheelbase) model. Or give it to your Westie. And what's probably the pick of the litter; the oversized Otis displacing more than half of an LR4's rear cargo area. Apparently he does indeed fit with the door closed.